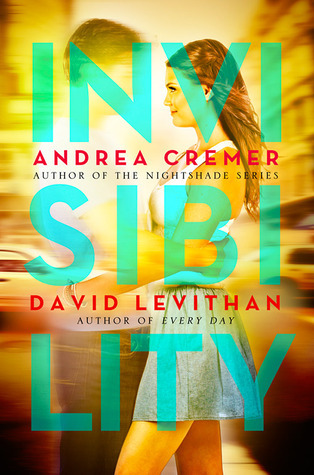 Invisibility is the second collaboration I have read by David Levithan, but the first I have read by Andrea Cremer. I was not disappointed by this book, I am a big fan of Levithan’s writing style and I’m looking forward to picking up something by Cremer. The narrative is told through the dual perspectives of Stephen, the invisible boy, and Elizabeth, the tough arty girl who moves into his building. I don’t know if Cremer and Levithan took a perspective each( as in Will Grayson, Will Grayson ), or wrote the whole thing together, but whatever they did it worked. Both perspectives have really clear voice, and it was extremely easy to differentiate between the two of them. There was no flicking backwards and forwards to the start of the chapter to try and figure out who was speaking like I’ve had to do with so many other books. I don’t know what I expected from this book, but for some reason I didn’t expect to find any magic in a book about an invisible boy. But this book quickly became quite heavy with fantasy, but the world is well introduced and the concepts are understandable. That being said, I much prefered the beginning of the book when the plot was more concerned with Stephen and Elizabeth’s relationship than the end of the book when it became quite bogged down with fantasy and magic. As there always seems to be in Levithan’s books, one of the main characters is gay. This is NOT a critique , but rather an observation. I actually agree with Levithan that gay people are severely underrepresented in YA literature, and I applaud him for almost singlehandedly taking on the job of presenting us with some LGBTQ+ characters. I do feel however that the way he deals with it is a bit heavy handed and preachy, but maybe it has to be. It’s kind of a shame that Levithan seems to be the only one writing about gay teenagers, but at least someone is doing it, and doing it quite well. Levithan and Cremer also present the idea that the best way to punish a parent is to punish their child, that inflicting pain on their child will cause them more pain than you could ever inflict on them. This is a really interesting concept, something that I had never thought of , and something that every budding psychopath should note for future use.